history and other aspects of the life of the Dogras. He said with the launch of the website of Dogri Sanstha now this information will be available to all at the click of a button at one site. He complimented Dogri Sanstha for this initiative which will be of great help to scholars as well as the general public. He said this will prove to be a great step in the promotion and popularizing Dogri Language and Dogra Culture. Zorawar Singh Jamwal who is also Chairman of Team Jammu, speaking on the occasion said that whereas the State Government is always found to be lacking in its constitutional duty to promote Dogri which is the 2nd major language of the State, it is organizations like Dogri Sanstha and the individual Dogri Writers who are keeping the flag of Dogri flying high. He said that if the Government of the day complements such efforts of Dogri Sanstha by introducing Dogri in School Curriculum in letter and spirit, this language can flourish at an unprecedented pace. In this respect he also referred to the order of the Hon’ble High Court to introduce Dogri at Primary level of School Education. 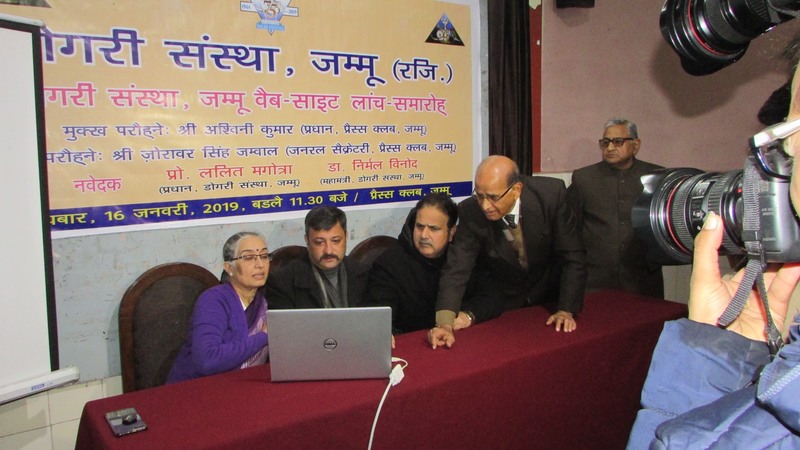 Earlier Prof. Lalit Magotra, President of Dogri Sanstha while presenting the details of the web-site, talked briefly about Dogri Sanstha, its formation and the role it has played from time-to-time to fulfill and meet all obligations to see that Dogri language develops in a wholesome manner. He said that the launching of the web-site should be seen in this light. Sanstha is trying to meet its obligation, in these times of revolution of media and communication. Dogri Language, Literature and Culture must have its rightful and prominent place in the web world. He said as it is just a beginning and website is a dynamic entity, over the period more and more information would be added to it to make it all inclusive. He lauded the effort and hard work put in by Prof. Shashi Pathania, the Vice-President of Dogri Sanstha who spearheaded design and development of the website. 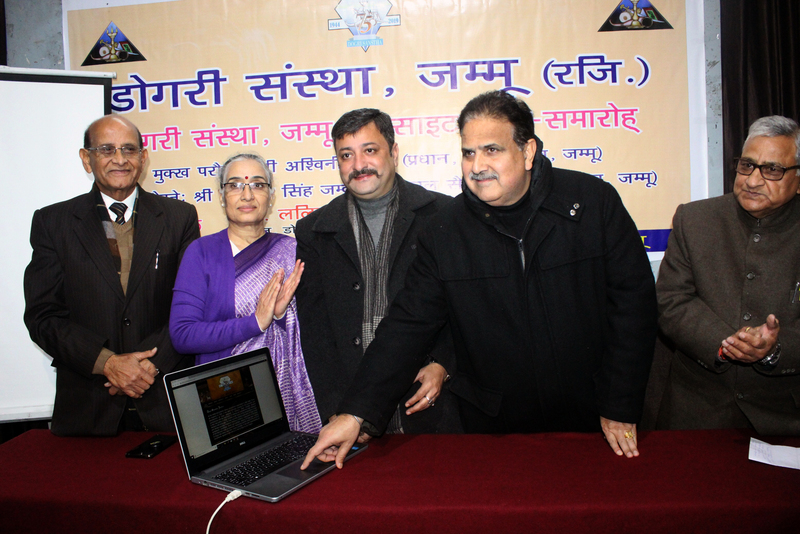 Prof. Shashi Pathania demonstrated various functions and aspects of the website during the launch ceremony. And she also informed the audience that they can access the site which is now live at www.dogrisanstha.org. All office bearers of Dogri Sanstha, members of working committee and a large number of writers were present on the occasion. Program was conducted and the vote of thanks was presented by Dr. Nirmal Vinod, General Secretary of Dogri Sanstha.